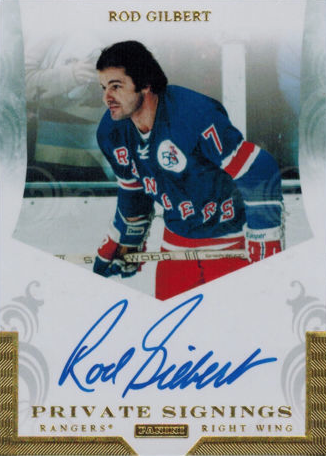 Rod Gilbert was one of only two players on the Retired Numbers list to spend his entire career with the New York Rangers, the other being Mike Richter. 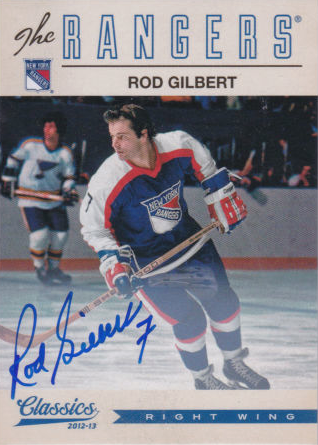 Gilbert’s number was retired on October 14, 1979. 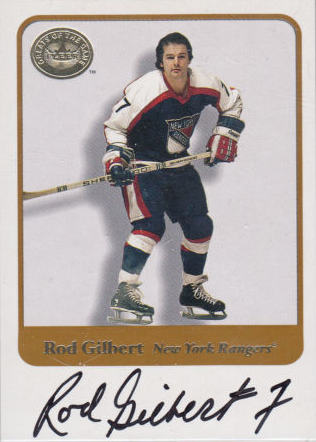 Even though Gilbert stopped playing in 1978 he is still the Rangers all-time scoring leader. During his 16 year career Gilbert played in eight NHL All-Star games. 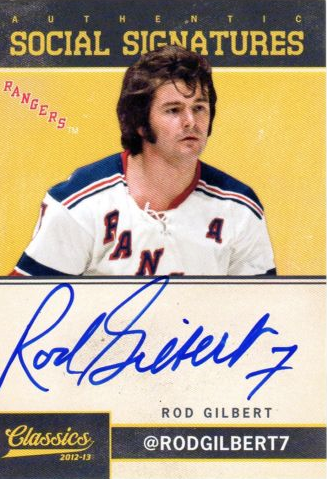 He was awarded the Masterton Trophy in 1975-76 and the Patrick Trophy in 1991. He inducted into the NHL Hall of Fame in 1982. 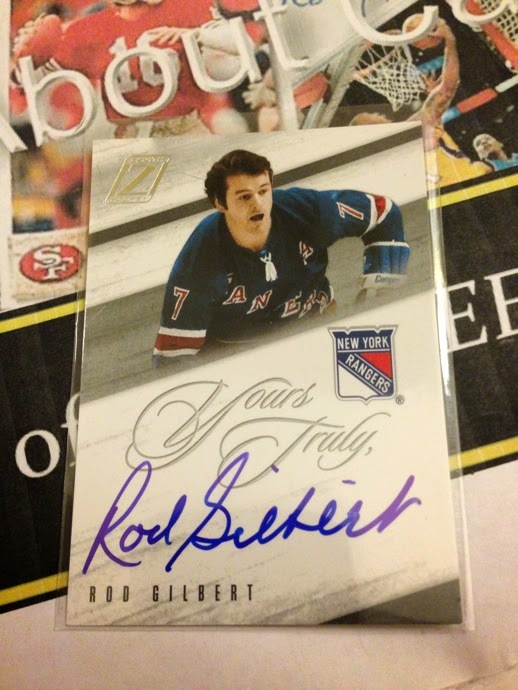 When it comes to Gilbert’s certified on-card autos there are about 40 cards available but about half of those include parallels, so there are approximately 20 unique card designs from which to chose. While I appreciate a wide variety of manufactures like In the Game, I tend to look for a card from one of the major manufacturers, unless the number of available options is extremely limited. In this case that number reduces to eight unique cards. 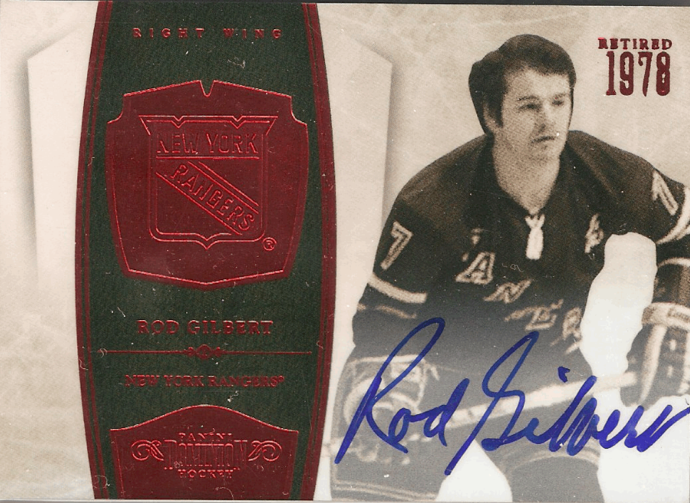 From the major manufacturers, Gilbert’s first on-card auto was obtained by Fleer for their 2001-02 hockey version of Greats of the Game. A solid card from a solid release. Other on-card options are 2008-09 UD Masterpiece Brushstrokes, 2010-11 Dominion Signatures, 2010-11 Playoff Contenders Classic Tickets, 2011-12 Panini Private Signings, 2012-13 Classics Signatures and Social Signatures, all of them some pretty nice choices. But the card I have is the 2010-11 Zenith Yours Truly Autograph. In this case, I didn’t choose it, it chose me. 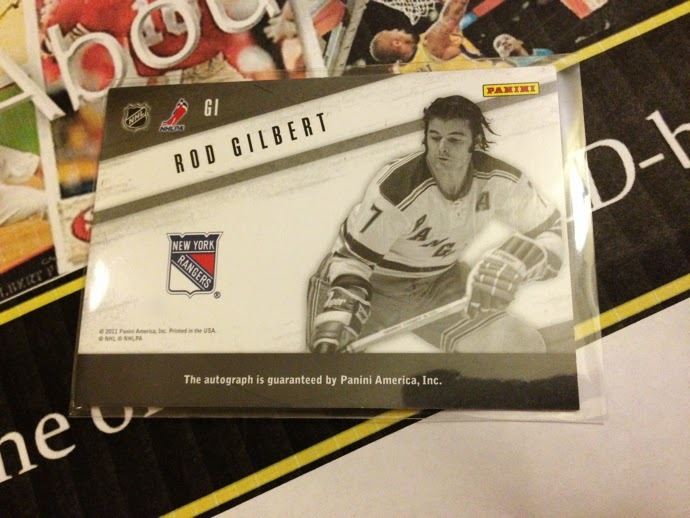 This is a card I won from the Sports Card Radio Forum after one of their breaks. While I did not select it, the card does have a lot of the elements I look for in an on-card auto. A nice sized photo of Gilbert with a clear area for his bold signature. It does not feel like he had to fit his autograph into a tight area. The photo on the back is different than on the front. It's not numbered but it is certified and that’s good enough for me. Currently you can find most of the cards I mentioned above street valuing between $10 - $20 so his auto is not one that will break the bank. Next time I’ll cover the second Ranger to have their number retired, Ed Giacomin.